Description: With some of the tightest fairways on Long Island, this seemingly shortish track plays a lot longer than the yardage on the scorecard. With rolling terrain and great stands of trees, almost all tee shots require both length and accuracy. The greens are a pretty decent size and normally undulating, if not drastically tiered. 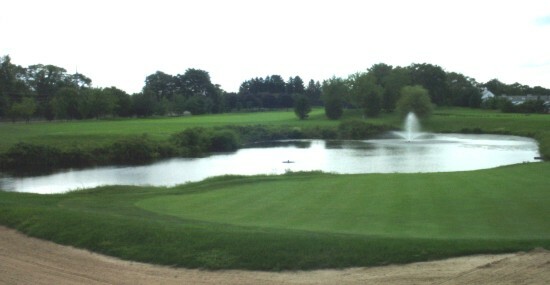 The water to the right of the par-4 13th green. The front nine plays a bit tougher, but the back shows its teeth on the closing three holes. Each is a par-4 playing over 440 yards through tight, well-bunkered fairways to small, multi-tiered greens. The fairway on the 17th cuts a swath through beautiful huge pines and the staff likes to say it wouldn’t look out of place at Augusta National. With water coming into play on about seven holes, there is also an ample amount of opportunity to pile up the penalty strokes and eventually find yourself with a score a lot higher than the way you think you played. Reader Comments: I’ve never played a course with tighter fairways. Punishing, if you don’t hit it straight ... I spent all day hitting out from behind trees, and I couldn’t have enjoyed it more ... Defintiely not for beginners ... In great shape and a real test of course management ... The greens really required a deft touch, not just for chipping and putting, but for all approach shots ... Always a special treat for my son and me whenever we play here. It’s a beauty, and without a doubt one of our all time favorites. Description: Originally designed by Robert Trent Jones as a private golf facility, Hominy Hill was acquired by Monmouth County in 1977, but hasn't changed the class level. Reader Comments: A classic design that has stood the test of time ... The best public course I've ever played ... A straightforard, honest test of golf ... Very difficult and challenging par-3s ... A terrifici layout that tests all your skills ... Not too conducive to beginners.